In today’s’ exclusive story about CEE startups I’d like to introduce you to a startup from Hungary that has a direct impact on human lives. The article will be very detailed, and I hope some smart investors reading the blog will appreciate the piece, and maybe participate in their next funding round. But before revealing who they are, let me start with some startling statistics. According to World Health Organization, HAI (health-care associated infections) cause 1.4 million cases a day globally, leading to a quarter of a million unnecessary deaths a year in the developed countries alone. Western hospitals still have a 10% average HAI ratio despite governmental campaigns and global educational programs. In sterile manufacturing environments, 89% of product contamination originates from human workers. A batch infection in a biotech plant and bioreactor can cost €10M. Fast food restaurants and luxury hotels struggle with food-borne illness causing a loss of reputation while virus-related outbreaks force cruise liners to be quarantined every year. To come up with a solution to the HAI problem, HandInScan Ltd. was created in 2012 as a spin-off of the Budapest University of Technology and Economics. Original founders were private individuals from the engineering development team, aiming to create a device to objectively control hand hygiene performance of medical staff. HandInScan Ltd. is lead by Peter Róna, CEO and founder, and Tamas Haidegger, CEO/CTO and founder. The scientific credentials of the team and the clinical experts onboard are worth a separate article. Hand-in-Scan is a novel hand hygiene control system for the direct and objective evaluation of hand hygiene. 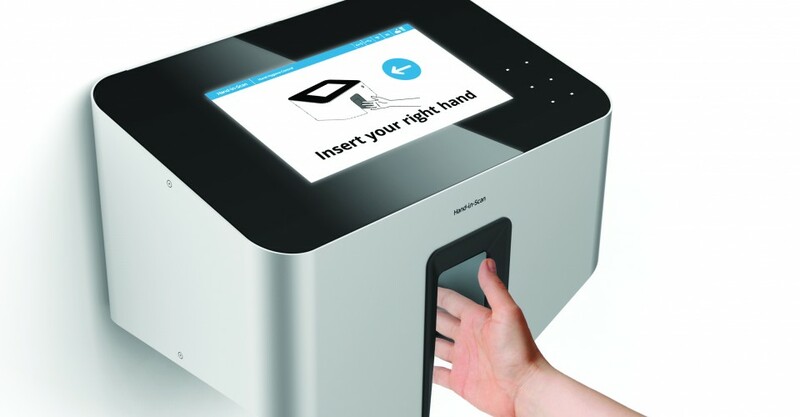 The system provides real-time feedback on the efficacy of hand hygiene, and users are identified by RFID technology. The system uses ultraviolet light (UV-A), digital imaging and Artificial Intelligence software methods to highlight disinfected versus unaffected areas after regular hand rubbing. Then it provides an objective overall quality score, reports it via an intuitive software, and creates periodical reports and statistics. Now you see if your hands are clean or not. Hand-in-Scan is a digital scanner operated by an integrated computer. The user logs into the scanner with a RFID card. Then he must disinfect hands with a special alcoholic handrub, which contains UV-dye. After handrubbing the user must insert both hands into the scanner to let it scanned by a digital camera using UV-A light source to detect the coverage of the alcoholic handrub on the hands. The image analysis software detects the disinfected area and the not-disinfected area using the digital pictures made in UV-light and can display it on the color screen of the built-in display. The disinfected area will be shown with green, the not disinfected area will be displayed with red color in order to allow a fast and easy interpretation to the user. The result (whether the user passed or failed) will be calculated based on the percentage of the covered area vs. missed area. This limit for the final judgment can be set according to the customer needs. The scanned pictures will be saved in the scanner’s memory and are connected with a user ID, authenticated by the RFID card. The scanner has an integrated wi-fi unit and a mobile phone 3G unit, which can be used for connection to the internet. After establishing an internet connection, the scanner uploads all data to the cloud, where a reporting software is running. The management of the institute can get access to this reporting system, where all the data can be analyzed. – in health care: avoiding additional patient nights caused by HAI can save an average US hospital €400k annually. Other sources confirmed that 1% improvement in hand hygiene compliance would already result in €35k saving annually. – in sterile manufacturing environment: controlled hand hygiene can significantly reduce the probability of a batch infection in a biotech plant, which can cost €10m or more. In hospitality: loss of reputation can seriously harm stock prices and revenues of a company. 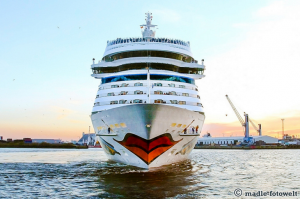 For instance, ruise liners typically repay the ticket prices after a severe infection. The US alone has over 2.7 million hospital and nursing home beds with HAI causing €32bn losses each year. 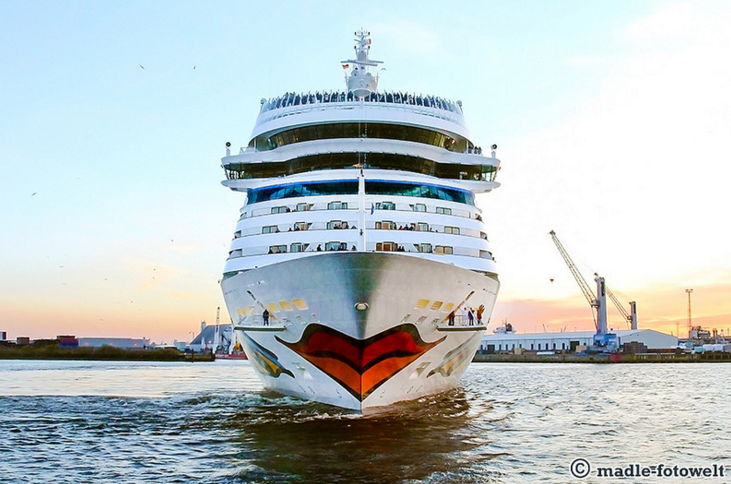 Virus-related outbreaks force cruise liners to be quarantined every year. Image source. The company started its sales activities in 2015 and succeeded to sell the scanners in almost 20 countries. Main customer acquisition channels are exhibitions, scientific conferences, personal contacts, SEO. Also, HandinScan maintains a strategic cooperation with leading research institutes and international professional organizations, and directly approaches key opinion leaders at eminent hospitals in each country. Hand-in-Scan’s will be sold as a hardware unit (affordable compared to competitors) and they will also provide Training-as-a-Service. To put Hand-in-Scan’s value-cost ratio in perspective, we will turn to competitive price benchmarks. For instance, a UV-light based manual training box (with no feedback or digital imaging) starts at €500, available from multiple companies. The more advanced software-based teaching assistant, limited to hand hygiene training only, is marketed by SureWash for €25,000. Event compliance monitoring device systems are sold at €0.4–2k per hospital bed, costing between €70–200k for a 100 bed hospital. For example, Xhale Ltd. does not disclose what it charges for HyGreen (recently installed in 25 Saudi hospitals, but a user said his medical center is paying about €1,450 per bed upfront). It is important to emphasize that all compliance monitoring systems listed above primarily and only focus on event compliance, checking on the occurrence and frequency of hand rubbing, but not the quality. But understandably, if the alcoholic solution is not applied correctly, its effectiveness remains low. There are only two companies approaching the problem with more direct performance measurement of hand washing technique, the SureWash educational system and Hand-in-Scan. 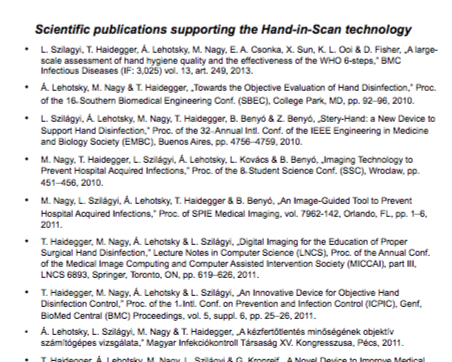 Hand-in-Scan is the only system applying control over the practice of point-of-care hand hygiene. Implementing the experiential learning theory, the user learns the correct hand washing technique while performing it in front of the device. Hand-in-Scan provides immediate feedback on hand washing performance, resulting in healthcare worker’s hand hygiene compliance and technique improvement. The system eliminates the blame factor, and helps to avoid the boss-subordinate conflict. 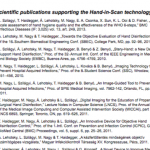 Click here to view the list of scientific publications supporting Hand-in-Scan technology. In 2012, the team has successfully raised venture capital – $600k from DBH Investment – to finance the development of a market-ready prototype. The first prototype of Hand-in-Scan was released in 2013, and it has been already tested on more than 15,000 healthcare workers internationally. In 2014, the second generation device, Hand-in-Scan Medical Trainer was introduced to the market and received CE mark, thus became marketable in the EU. 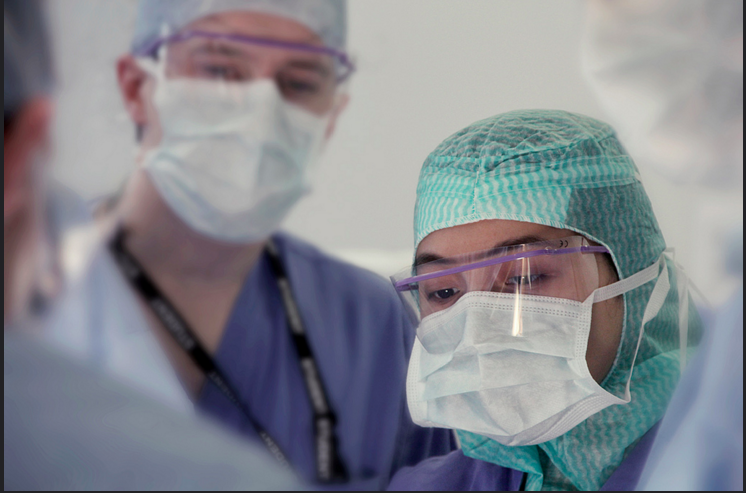 Field validation projects are completed in 5 EU hospitals. Scientific cooperation were developed with the National Health System (NHS, UK), Vienna General Hospital in Austria and the Hungarian Health Authority. In the end of 2015, HandInScan raised $1.45m in Series A from the Hungarian fund Perion Investment to finance the mass production and market entry. The company has also received a $800k grant from the Hungarian and Austrian governments. For 2016, their estimated sales volume is over 100 scanners in 25 countries. Hand-in-Scan is seeking to raise another round soon. The company is planning to raise the next round for strengthening sales in Western Europe, securing a strategic alliance with a major hand rub manufacturer, or other key industry leaders. Also, they are headed to enter the US market within two years via setting up direct sales and distribution channels there. Finally, they will continue working on system refinement and further technology development to meet the requirements of new segments by 2017, including biotech, hospitality and food production.